Through the placement of smooth, water-heated stones at key points on the body, this treatment will help relax your muscles, allowing the therapist access to their deeper muscle layers. 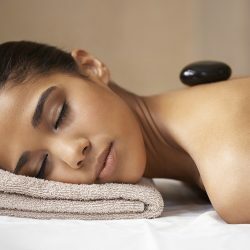 Combining hot stone protocols with a full body massage provides a very healing and effective experience. The hot stones also expand blood vessels, which encourages blood flow throughout the body. The hot stones have a sedative effect that can relieve chronic pain, reduce stress and promote deep relaxation. Should you have any questions about getting a Hot Stone Massage with us, please call us at 403-452-7899, email us here, or drop by our Panorama Hills location. We would be happy to consult you on your needs. 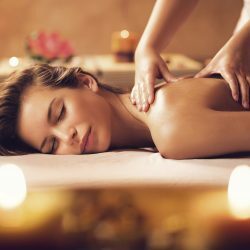 From the relaxing environment to the focused massages, Peace of Mind really does provide you with an extraordinary stress relieving experience. Convenient location, reasonable rates, very clean and nice decor. The staff are friendly and helpful and they actually deliver. Highly recommended for a great, therapeutic massage! I have been a client since they opened – and plan to remain one for years to come. Know someone who would benefit from a hot stone massage? Have a question? Use the form below, we would be happy to speak with you.